Above: On the foreground the German delegation (Müller, standing, and Bell, sitting) signing the Treaty of Versailles, on June 28th, 1919. Painting (detail) by W. Orpen. 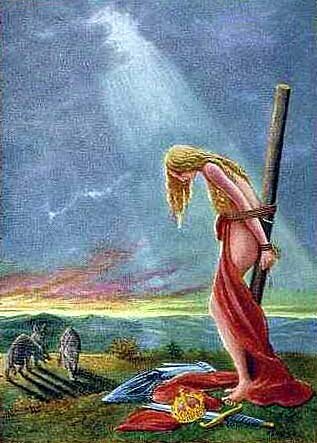 Under right: Lady Germania chained to a torture pole. German political picture, June 1919. Germany has to cede Alsace-Lorraine to France. Germany has to cede the coal mines in the Saar-area to France. Germany has to cede an area with Moresnet, Eupen, Malmédy and St. Vith to Belgium. Germany has to cede the main part of West-Prussia and almost the whole province of Posen to the new state of Poland. Germany has to cede all colonies: Togo en Cameroun, the territories in East- and South-West Africa, islands in the Pacific and possesions in China. All German properties in foreign countries are confiscated. Germany has to cede al war material to the allies. German compulsory military service is abolished, as well as the General Staff. Germany is not allowed to have tanks, airplanes, submarines, large warships and poison gas. During 15 years Germany is not allowed to station troops on the left border of the river Rhine and in a 50 km strip on the right border of the Rhine. The total size of the Germany army is not to exceed 100.000 men. The German navy has a maximum of 15.000 men. Germany is allowed a total of 4.000 officers. Germany is not to take part in the League of Nations. Austria has to cede South-Tirol to Italy. Turkye has to cede all foreign possesions. England gets Iraq, Palestine and Trans-Jordan, France gets Syria and Libanon. Germany has to cede to the allies all seagoing ships with a carrying capacity exceeding 1600 Brt, plus half of all ships between 1000 and 1600 Brt. Furthermore one fourth of the fishing fleet and two fifths of the inland navigation fleet has to be ceded. Germany has to cede large amounts of machinery and building materials, trains and trucks. Germany has to deliver certain amounts of coal, chemicals, dye and fuel for many years. All German subocean telegraph cables are confiscated. Germany has to pay 20 billion goldmarks. Note 1: The reparations were progressively reduced by the Dawes (1924) and Young (1929) Plans. In 1932 they were forgiven completely. 2. Destruction of the nation's political stability that allowed major riots and street battles between Communists, Nazis and others, leading to the successful grab for power by Adolf Hitler. Note 2: The terms imposed on Germany at Versailles were much more mild than those Germany had imposed on Russia (the Brest-Litovsk treaty, summer 1918), or those that Germany planned to impose on the Western Allies if she had won the war - including, among other things, the subjugation of Belgium, innocent victim of German aggression in 1914. Note 3: Had the Versailles Treaty been applied as envisioned Germany would not have been rearming in 1932. The fact that Germany did rearm was not a problem brought about by the Treaty. In the end, Versailles became a dog's dinner. It neither crushed Germany enough to stop her rise again, yet it was still able to humiliate her.